Student voting rights are under attack — and Dartmouth should be worried. Throughout the 2016 election cycle, President Donald Trump’s claim that the election would be “rigged” was dismissed by political commentators and elected officials as fanciful and improbable. However, examining the impact of stripped voter protections, it’s clear that the election was, in fact, rigged. The Supreme Court’s 2013 decision in Shelby County v. Holder seriously weakened the Voting Rights Act before Americans went to the polls on Nov. 8, which disproportionately targeted and disenfranchised lower-income Americans and people of color — communities that are statistically more likely to vote for Democratic candidates. Looking at these restrictions, we can see that the political battles regarding voting rights have serious implications for Dartmouth students. The Supreme Court’s 2013 decision has emboldened legislators seeking to make the voting process more difficult, particularly for politically vulnerable communities — like people of color, lower-income Americans and students. North Carolina’s state legislature passed now-infamous legislation targeting African-Americans with “almost surgical precision” only two months after the Shelby County decision. The Fourth Circuit Court of Appeals struck down this law, but in at least 14 other states, including New Hampshire, post-Shelby County legislation restricting voting rights remains on the books. Our home state is leading this charge by introducing over 10 new bills deliberately targeted at restricting student voting. These efforts have been bolstered by Governor Chris Sununu’s false claim that “the Democrats are very sly” and that, thanks to New Hampshire’s same day voter registration, “when Massachusetts elections are not very close, they’re busing [voters] in all over the place.” Politifact rated the statement “Pants on Fire,” or completely false. The content of the legislation varies, but all of the bills are clearly intended to strip students of our voting rights. One bill eliminates same-day voter registration, a method used frequently by Dartmouth students. Some bills require voters to register vehicles in-state at a substantial cost, effectively creating both a logistical burden and a poll tax. Others redefine the term “domicile,” requiring New Hampshire voters to demonstrate that they intend to live in the state for the “indefinite” future. This term excludes not only students but also other groups, such as active duty military personnel, medical residents, volunteers with organizations like Teach for America and people seeking specialized medical treatment in other states. So what can we as Dartmouth students do about this? College Democrats hold workshops and events where students can call, write letters and speak with state senators and representatives about this issue and others. Action is key: Dartmouth students must send a message to Concord that our voices, our values and our votes will not be silenced. Dartmouth students from both sides of the aisle should be alarmed by this declaration of intent to strip us of our voting rights. The 1994 law providing for same-day registration in New Hampshire was passed by a Republican-controlled state legislature and signed into law by a Republican governor, demonstrating that the issue of voting accessibility is certainly not a Democratic cause and should not be treated exclusively as such. Protecting the integrity of our voting process should be a high priority for all Dartmouth students. Just as we lead our nation as the first state to cast our ballots in the presidential primaries, we should lead in protecting the right to vote for all of its citizens. 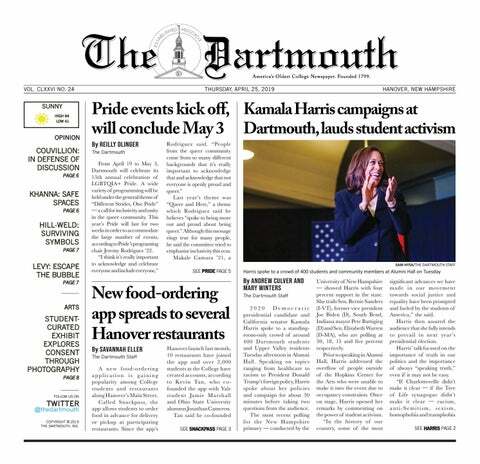 Let us stay vigilant as to prevent a backsliding that could return us to the early days of our democracy, where most of today’s Dartmouth students — myself included — would not have been able to vote. West is the Communications Director for Dartmouth College Democrats. She also worked at the Hillary for America and Maggie for New Hampshire campaigns.